To honor Dads during the Month of June, I'm posting prayers especially for Dads! I pray it ministers to you in a special way! Thank you for all you do! 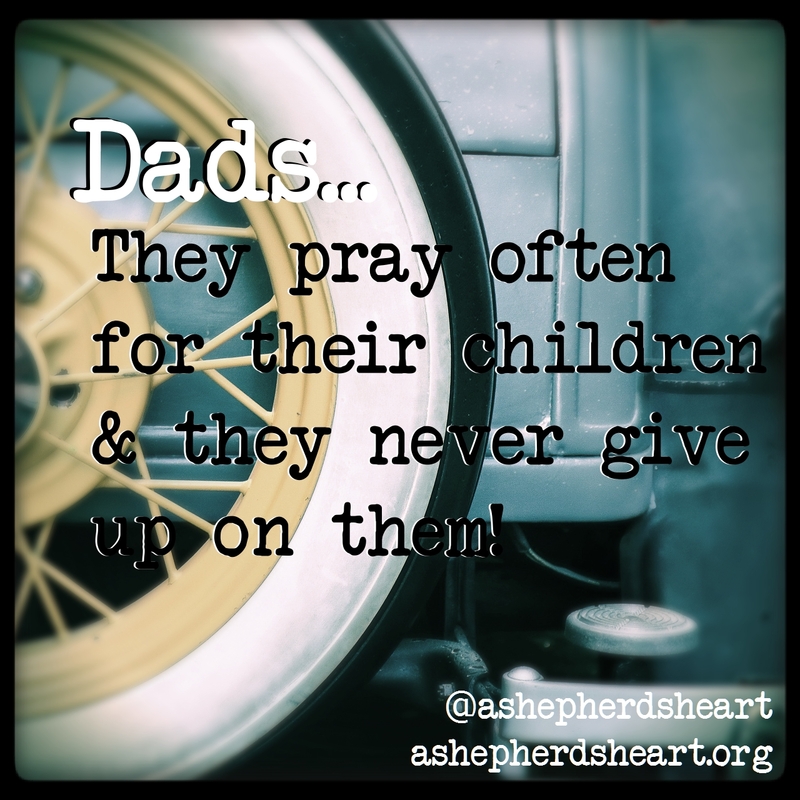 This is the finally prayer post for dads for this month. I'm so thankful that You hear the prayers of Your children and we can approach You with confidence. You never promised that parenting would always be easy but it is definitely a special gift and responsibility that You've given me to be a dad. There are many who don't have this privilege so please help me never take this for granted. As I read Your Word I see many prayers, the examples of those who prayed often (including Jesus) and it's by no coincidence that You instruct to to always pray...to pray unceasingly and there are certainly many things to pray for! I believe that I have an incredible urgent responsibility to fervently pray for my Children. Father, help me to pray hard, faithfully and often for my Children! I pray that they know how much they are truly loved by You and I.
I pray that You help me daily show them how much I love them! I pray that I can help them know their worth in You. I pray that I can help them cultivate their gifts, skills and talents. I pray that I can successfully help launch them into adulthood. Help me to be a fervent and faithful man of prayer - especially for my family always. how crazy they make me sometimes! I pray for the help of Your Holy Spirit that I never lose hope and never ever give up on them! Help me Father to love them unconditionally and if they veer far or mess up...that You help me receive them with love and arms open wide just as You received me when I was far away from You! Help me to always be for them as You're always for me!